Anyone who thinks there aren’t very good driving games for the Macintosh clearly hasn’t been paying attention to Feral Interactive’s contribution to A-list Mac gaming. Colin McRae Rally Mac is the fourth major motor racing title Feral has brought to the platform, and it is their best to date. The development of this game has been fraught with problems. Apple’s switch to Intel Macs, some behind-the-scenes changes at Feral and other issues conspired to keep this game from being released until fairly late into 2007, despite it being based on PC-game underpinnings that Windows gamers have been enjoying since late 2004. 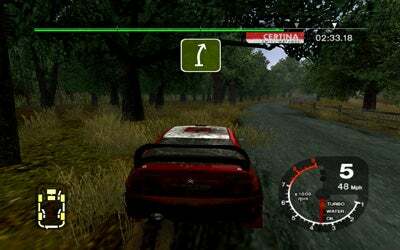 Feral wisely chose to make this release as independent of the PC franchise as possible to avoid any issues that might date it, calling it “Colin McRae Rally Mac” rather than attaching a year to it. Alas, fate conspired against Feral one last time—it couldn’t possible have foreseen the tragic death of Colin McRae himself, one of rally motor racing’s most decorated winners. McRae died in a helicopter crash in September, mere weeks before Feral shipped its game. The game features more than 30 different real-world cars—rally versions of everything from cars you might see on U.S. roadways like the Ford Focus, Mitsubishi Lancer and the Subaru Impreza, to cars from Lancia, Peugeot, Mercedes-Benz and many others. You’ll get an opportunity to throw two-wheel drive cars and four-wheel drive cars around the tracks over about 300 stages of competition across 20 different classes of events; everything from Challenges to Cups and Championships. Road Hog : You can go off road a bit in Colin McRae Rally Mac, but it’ll beat up your car, as evidenced by the yellow damage meter. Not only do you need to understand how to handle your car as it pitches around twisty chicanes at high speed, threatening to drop off cliff faces or slam into trees and boulders, but you also need to carefully listen to the instructions of your Welsh co-driver Nicky, who’s constantly (and calmly) providing you with a running monologue of what’s ahead and what speed to take the next turn at. He’s a bit like having a GPS system in the car with you, although it takes a while to understand his shorthand (Calling out a “long six” means that there’s a long turn that you should go flat out on up ahead, while “hairpin two” means there’s a very tight turn that you should take relatively slowly). Graphics in Colin McRae Rally Mac are gorgeous, with realistic weather effects, dramatic lighting and a really broad color palette being used to great effect. You can see trees swaying in the breeze or watch leaves falling or snow blowing by; see the piercing gleam of headlights, or sun reflected in the windscreen of your rally racing car. Rally racing is marked by stages—segments of a race that are several miles long. This breaks up the game play into very short segments, typically only four or five minutes long at most, and that seems a bit abrupt to me. I admit I’m no rally racing expert—you really have to go hunting around the upper tiers of American cable television to find any to watch, it seems—but I think generally courses are a bit longer in real life. And Colin McRae Rally Mac clearly revels in its realism. This ain’t no NASCAR —there’s a lot more than left-hand turning the car on endless oval tracks. Rally races are on twisting, turning roads that vary widely in terrain. And also, there’s no other group of cars to chase or hit—you’re racing for the best time. Colin McRae Rally Mac does let you view “ghost cars” if you want to see how your competitors have done on the same track; that can give you the proper incentive to go just a bit faster around that next corner. Gameplay is varied thanks to several modes you can choose from. A “challenge” mode pits you against other players in individual stages or rallies, which will extend across multiple stages; a championship mode; and a career mode that lets you duke it out against other computer-controlled components for the bragging rights to the season. You can earn new gear as you go along to help you. Both graphics and sound effects are top-notch in this game. You have a few options to adjust that enable you to modulate graphics effects and performance; some are available when you first launch the game, in a front-loading interface Feral tacks on, and others are available within the game’s options itself. Because of some of the graphics in the game, Colin McRae Rally Mac isn’t supported on MacBooks and Mac minis—systems that use Intel GMA graphics. Sound effects aren’t extensively used; there a few different view modes, each of which offer you a different audio experience. Viewing the car from above and behind, for example, distances you from engine and road noises, while the bumper’s eye view will give you the steady rumble of the pavement and the clank of the transmission locking into different gears. The game supports game controllers, as well. I tested it with a MadCatz PC Con controller, which worked well—unfortunately I couldn’t test it out with a steering wheel (my fault, not Feral’s). Colin McRae Rally Mac has multiplayer support, too. Up to four players can play on the same computer using a split screen, and over the Internet, the game defers to GameRanger, the Mac-only online game matching service, in order to find other players. That requires you to download a separate client application and register for an account, both of which are free for the purposes of playing the game online. Finding someone to play against is a tougher proposition, and I don’t like the way that Colin McRae Rally Mac “kicks you out” to open GameRanger—it’s very abrupt. I’d prefer an integrated game finder, or something that bridges a connection to GameRanger from within the game itself. It’s unsettling to find yourself back at the Finder without understanding what you’re supposed to do next. There is a LAN-based gameplay mode as well, for those of us lucky enough to have Macs running the game on the same Local Area Network. Rally racing has been tried before on the Mac, mainly in shareware form, and while adequate, it’s never looked, sounded or performed so well. If you’ve ever wanted to kick up mud and dirt as you throw a 300HP all-wheel-drive foreign coupe around hairpin corners, this game is for you.